We take up to 14 guests per week. This insures first-class service by our professional chefs and guides. Your hosts, Charles and Jody Allen, are also on site with you. 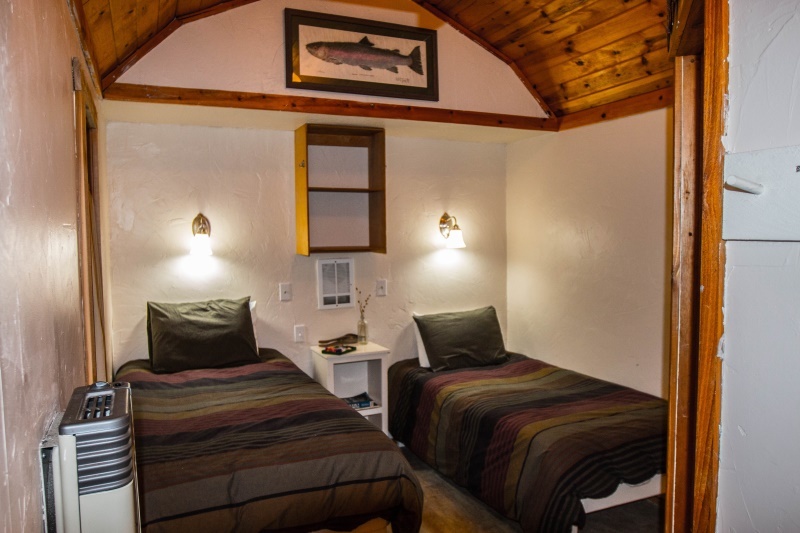 Comfortable private cabins await guests when they return from the river. Each cabin is fronted by a broad deck where there is plenty of room to remove gear. Numerous amenities help you care for your gear at the end of the fishing day, including boot and wader racks, rod racks and a high pressure hose to wash off waders. Propane heaters warm the cabin quickly and a private bath in each cabin ensures a refreshing shower for everyone after the fishing day. In the mornings, guides are happy to bring coffee to your cabin piping hot and just the way you like it. Wide boardwalks connect all the cabins to the dining lodge and observation lounge. What really impressed me was the attention to detail the Driftwood Lodge gave our group. From the fully stocked fly-tying bench to steaming mugs of coffee delivered to my cabin each morning for my wake-up call -- this is a First Class fishing lodge!